Sometimes it’s good to try and pull things together. In a new paper published in the journal Biosensors and Bioelectronics, a team of scientists from the University of Glasgow’s School of Engineering outline how they have built a stretchable, wireless system which is capable of measuring the pH level of users’ sweat. The University of Glasgow team’s new system is built around an inexpensively-produced sensor capable of measuring pH levels which can stretch and flex to better fit the contours of users’ bodies. Made from a graphite-polyurethane composite and measuring around a single square centimetre, it can stretch up to 53% in length without compromising performance. It will also continue to work after being subjected to flexes of 30% up to 500 times, which the researchers say will allow it to be used comfortably on human skin with minimal impact on the performance of the sensor. The sensor can transmit its data wirelessly, and without external power, to an accompanying smartphone app called ‘SenseAble’, also developed by the team. The transmissions use near-field communication, a data transmission system found in many current smartphones which is used most often for smartphone payments like ApplePay, via a stretchable RFID antenna integrated into the system – another breakthrough innovation from the research team. 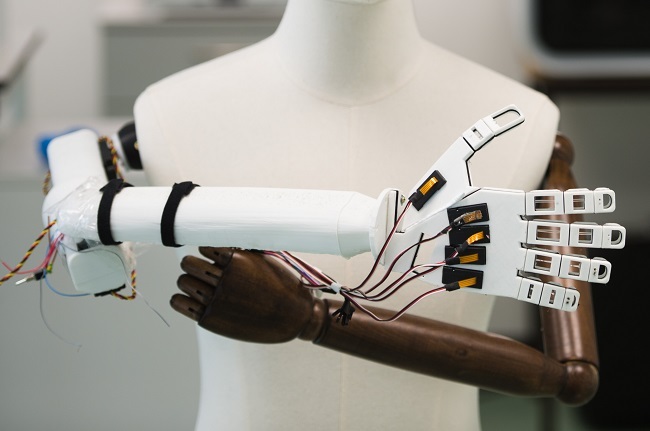 The research was led by Professor Ravinder Dahiya, head of the University of Glasgow’s School of Engineering’s Bendable Electronics and Sensing Technologies (BEST) group. Professor Dahiya said: “Human sweat contains much of the same physiological information that blood does, and its use in diagnostic systems has the significant advantage of not needing to break the skin in order to administer tests. The team’s paper, titled ‘Stretchable Wireless System for Sweat pH Monitoring’, is published in Biosensors and Bioelectronics. The research was supported by funding from the European Commission and the Engineering and Physical Sciences Research Council (EPSRC). Now, a team of researchers at UBC’s Okanagan campus have developed a practical way to monitor and interpret human motion, in what may be the missing piece of the puzzle when it comes to wearable technology. The goal was to make something that could stretch, be flexible and a reasonable size, and have the required sensitivity, performance, production cost, and robustness. Unlike an inertial measurement unit—an electronic unit that measures force and movement and is used in most step-based wearable technologies—Najjaran says the sensors need to be sensitive enough to respond to different and complex body motions. That includes infinitesimal movements like a heartbeat or a twitch of a finger, to large muscle movements from walking and running. 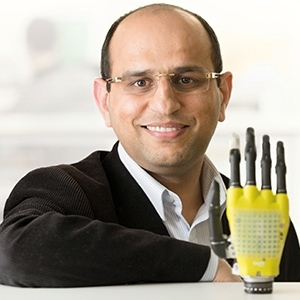 “We have introduced an easy and highly repeatable fabrication method to create a highly sensitive sensor with outstanding mechanical and electrical properties at a very low cost,” says Hoorfar. Hoorfar and Najjaran are both members of the Okanagan node of UBC’s STITCH (SmarT Innovations for Technology Connected Health) Institute that creates and investigates advanced wearable devices. The term ‘wearable tech’ covers a lot of ground. In addition to sensors, there are materials that harvest energy, detect poisons, etc. making for a diverse field. This entry was posted in clothing, electronics, graphene, medicine, nanotechnology and tagged Allen O’Brien, ammonia, bio-signals, biomedical devices, Canada Natural Sciences and Engineering Research Council, cancer, chronic conditions. diabetes, complex human motion, European Commission, flexible wearable sensor, flexible wearable tech, GloVe, glucose, GNF-Pad, graphene nano-flakes (GNF), graphite-polyurethane composite, haptic technology, health monitoring, heart rate, Hojatollah Rezaei Nejad, Homayoun Najjaran, knee band, Leandro Lorenzelli, Libu Manjakkal, Low-cost ultra-stretchable strain sensors for monitoring human motion and bio-signals, Michael Oyatsi, Mina Hoorfar, monitor, muscle movement, near-field communication (NFC), Patty Wellborn, Ravinder Dahiya, running, Scotland, SenseAble, Seyed Reza Larimi, smartphone app, STITCH (SmarT Innovations for Technology Connected Health) Institute, stretchable RFID antenna, Stretchable wireless system for sweat pH monitoring, sweat, UBC Okanagan, UK Engineering and Physical Sciences Research Council (EPSRC), University of British Columbia, University of Glasgow, urea. kidney disease, Vincenzo Vinciguerra, walking, Wenting Dang, William Taube Navaraj, wristband on June 6, 2018 by Maryse de la Giroday.